Hello, I hope everyone is well. It's been a while since I've written a post but I've not been slacking as we've recently moved house following a fun and successful Photography Show at the NEC. I've also been back out with my camera and notebook recording and photographing the wonderful wildlife of Somerset including adders and toads, more about the adders in the next post, for now the rest of this post is all about the wonderful little creatures common toads (Bufo bufo). This year is the first year I have properly photographed them and have dedicated several days to spending time with them as they embark on mating and all things related. 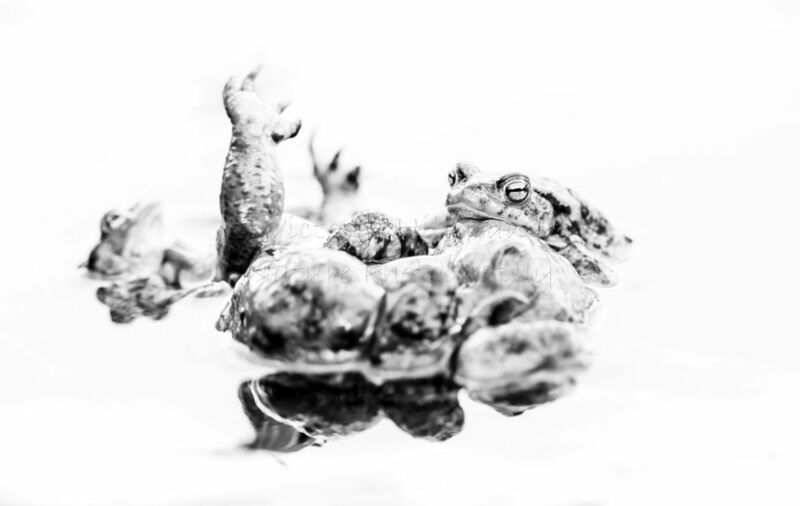 I have concentrated on just one pond and surrounding areas capturing them in the water, on the water, in amplexus (the mating embrace of toads and frogs) and even mating balls. These really are wonderful animals with each one having its own character and it is a lot of fun just watching as they make their way around, join mating balls, males attempting to grab onto males and the most adorable little noises they make as they do! Time for some photos and a video of a mating ball. I came across this little one poking his head out of the water with a perfect reflection thanks to the very still day. This is the mating ball the toads were coming into join, unfortunately the female was already dead as can happen when she becomes swamped with so many males, however the males are so determined it didn't stop them. I came across this pair making their way to the pond in amplexus with the larger female underneath carrying the smaller male. I still have a lot more toad images to sort through and process, this is just a small selection but I have really enjoyed my time with them this year and will leave you with this one last image of a reflective toad. I will be gradually updating the galleries adding more toad, adder and slow worm photos over the next month or so but in the meantime you can keep right up to date and see lots of photos over on my Facebook and Instagram pages which I will post new photos to regularly. I hope you've enjoyed my adventure with toads as much as I did.